It is not a unique image in Berlin: An old building, full of graffiti and street-art, which seems to be a dull and boring building during the week transforms into a crowded place during the weekends. The Berlin club About Blank is defenitely one of the best examples for a building with two different faces. 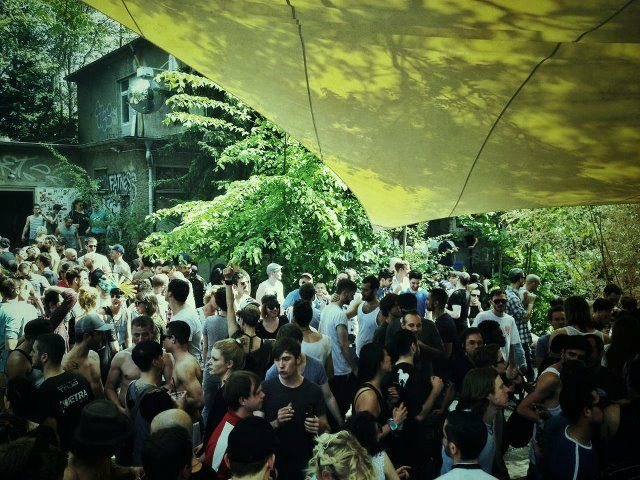 When you ask people about the best clubs in Berlin, you will often receive answers like Sisyphos, Berghain or Watergate. These clubs are very popular and well visited, but the About Blank is one of these more silent clubs which made a name in the last couple of years. 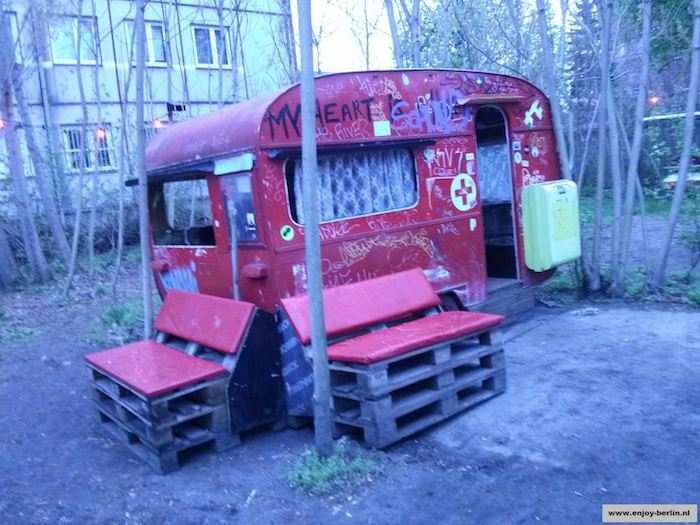 Even the real Berliners like this club, especially for it’s non-commercial style and the raw looks. When you pass the club during the week you will not expect a lot, but in the weekends you will find long lines and great parties here. The photo above confirms that the entrance of About Blank is not very impressive. 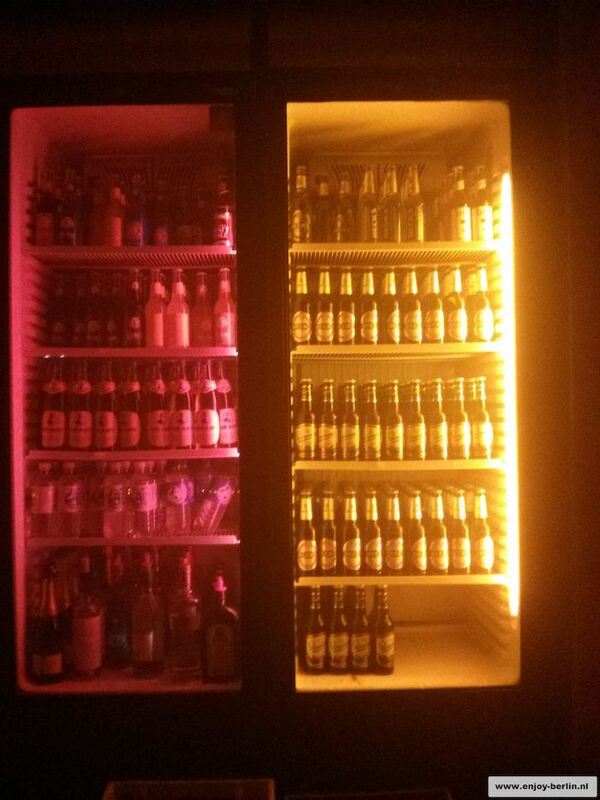 But as soon as the door closes behind you, all you can do is enjoy the great ambiance. Besides the two main dancefloors on the inside. Besides that, one of the great benefits of the club About Blank is the fact that it has a large garden. 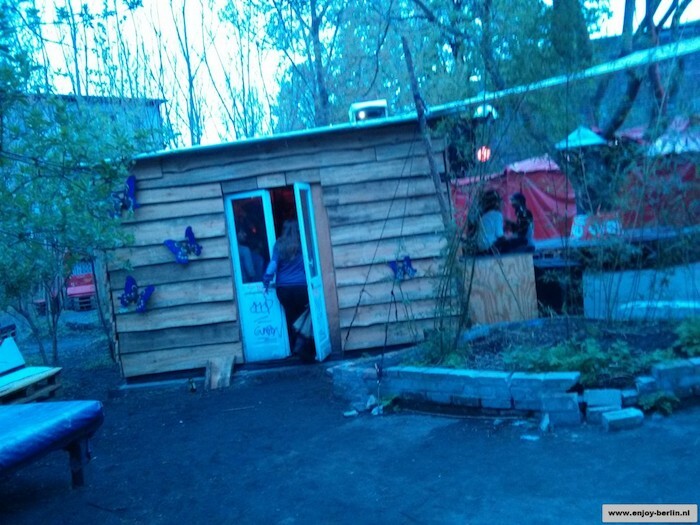 In this garden you can find funny gadgets like a small caravan and a bungelow with alternative music in it. If you get cold you can dance around a fire and often there are also party-tents to offer the visitors a third floor to dance. 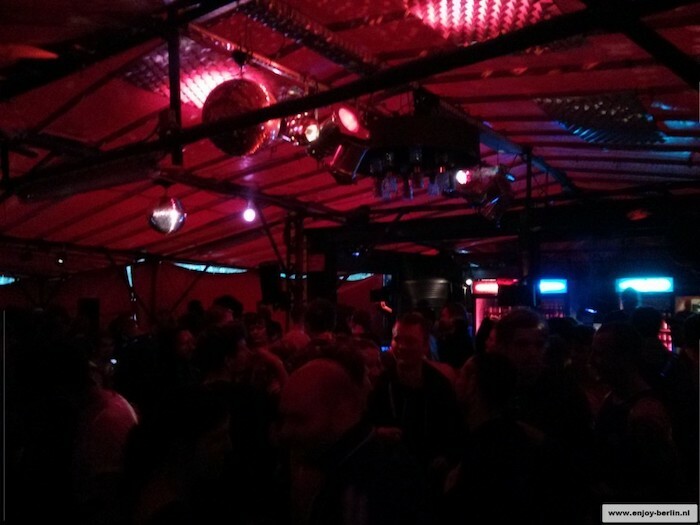 As the photos confirm: About Blank is a real Berlin-styled-club which can be compared to the Kater Holzig (R.I.P) or Sisyphos. Besides the fact that About Blank is probably the best club I have been the last couple of months, they also have a very versatile program when it comes to parties. Usually one of the floors is dedicated to techno but on the other floors you can find a whole lot of different styles of music. One party which is organized more than once a month is called Homopatik. As the name already indicates: This party in About Blank mainly focuses on homosexual party-people. But I can guarentee that this party is also great for hetero’s. The atmosphere is absolutely great and the music is good as always. 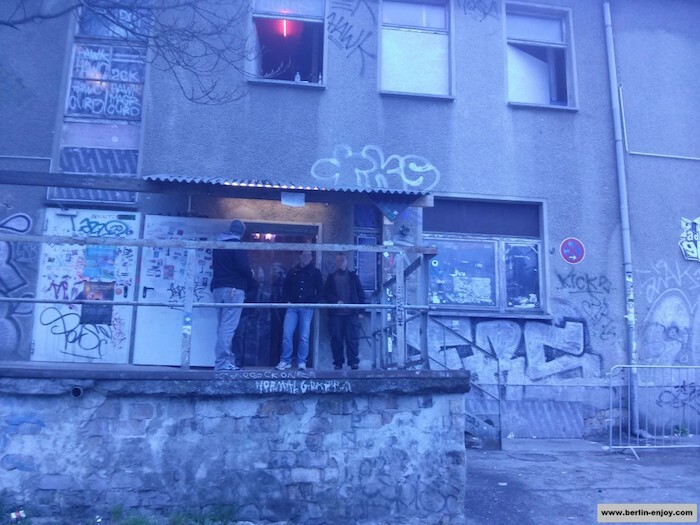 The door-policy of About Blank is not extremely strict like some other clubs in Berlin but there is also not a guarentee that you will get in (like the Rosi’s). In general we can conclude that if you are not totally wasted and have a normal attitude you will have no problem to enter About Blank. 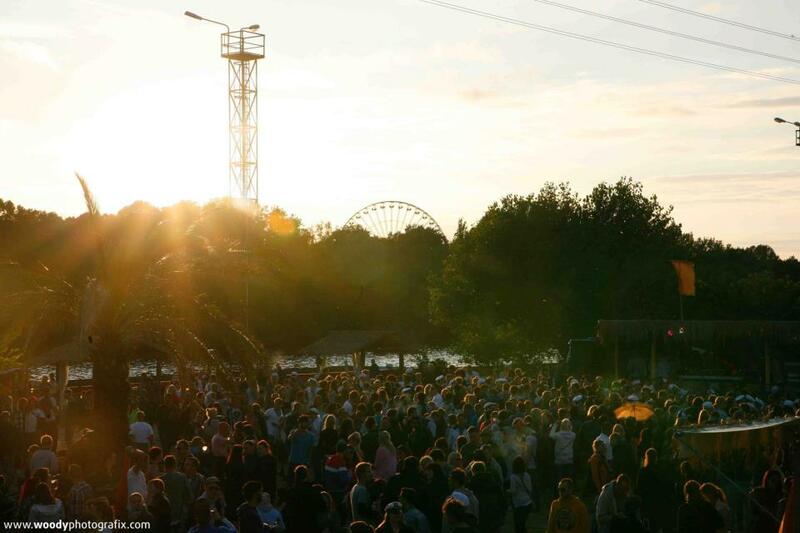 The entrance varies from 10 to 15 euro (depending on the DJ’s and the programm). Normally you will pay a bit more if there is a special weekend-program but this also means that you can party two or sometimes three days in a row. Beers (Becks) are 3 euro by the way. Hopefully my enthusiasm about the club About Blank has been made clear in this article. The club is defenitely in my top3 clubs in Berlin and if you have not visited this club yet, you should do it as soon as possible. If you want more information about the club and it’s line-up, I would advise you to checkout this website. I had a really good experience at About Blank – Cool bouncers – asking if I was alright(in a good mood) ready for having fun. Totally cool place – nice friendly people. great to hear that you had a nice night at the About:Blank. We also like the place a lot. Hi Job! so good to read this review. I don’t know why but it’s usually really underrated, personally I find it one of the coolest and with the best atmosphere in Berlin! And also, I never witnessed anything like zarathustra explains. I have seen people rejected (even I was rejected one time) but never with bad words or in a bad way at all. I always find the bouncers in Berlin to be strict but correct and polite. Thanks for the compliment, maybe you can use it when you are back here some day! Violently attacked by doormen, refused entry due to nationality!! 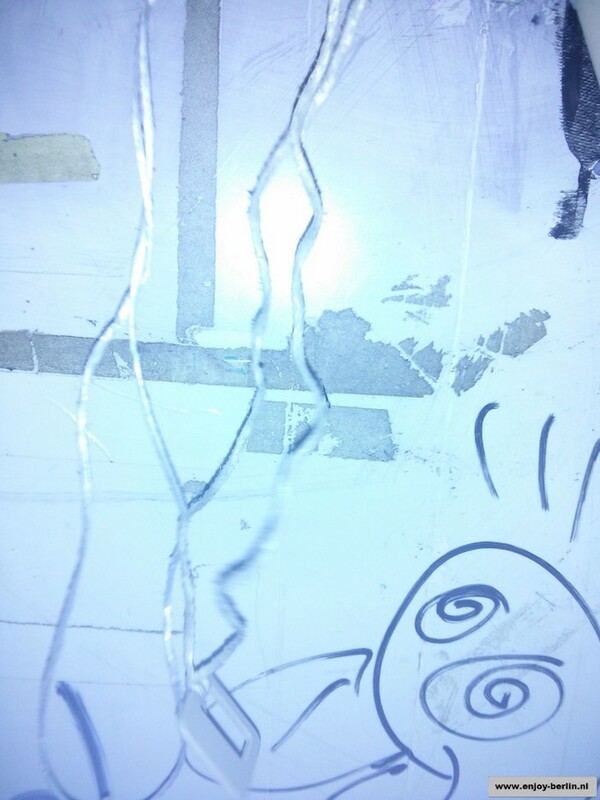 My friends and I (all English) went to the club last Thursday (26/11/15) and were denied entry to the club. Everyone else in the queue had been allowed in so far and we weren’t drunk or loud or aggressive in any way, nor were we dressed any differently to the rest of the queue (it was freezing so we all had coats on anyway), and so we asked why we weren’t. They said they couldn’t say why and we had to leave because we are trespassing (?!?) and then very forcibly pushed and kicked us all (mainly girls) backwards down the stairs, grabbed my boyfriend around his neck and had him in a headlock. Such disgusting behaviour! They then continued to let the rest of the queue (Germans) in. Reading other reviews I see other people haven’t been allowed in because they were English. So not only were we discriminated against because of our nationality (Isn’t that against EU law?! ), we were physically attacked, and they didn’t want to tell us because they didn’t want to admit it! We called the police for the attack but their discrimination has gone unchecked. Stay away from this club, and if anyone else is physically attacked by the door-staff, immediately call the police. Since we were attacked without provoking them at all, I imagine this happens every night. Sorry to hear that you had such a bad experience at this club. Personally I have visited this club quite often and never had or saw such things happen. Hope the rest of your stay in Berlin was good anyway!